Well I have had my Husqvarna Epic machine for a while now and thought I should share how I am getting along. I have been stitching away merrily. Here are my latest designs that I am working on for Easter. There will be lots more to learn in the coming weeks but I have found it such a delight so far. The days of waiting for designs to load on the screen or zooming in and out taking forever are over!!! Everything is so quick and responsive. It has its own little rhythm of sounds as it starts and stops which I have got used to. I love getting the messages on my phone to change a colour, replace the bobbin or that my embroidery is finished, when I am not in my studio. 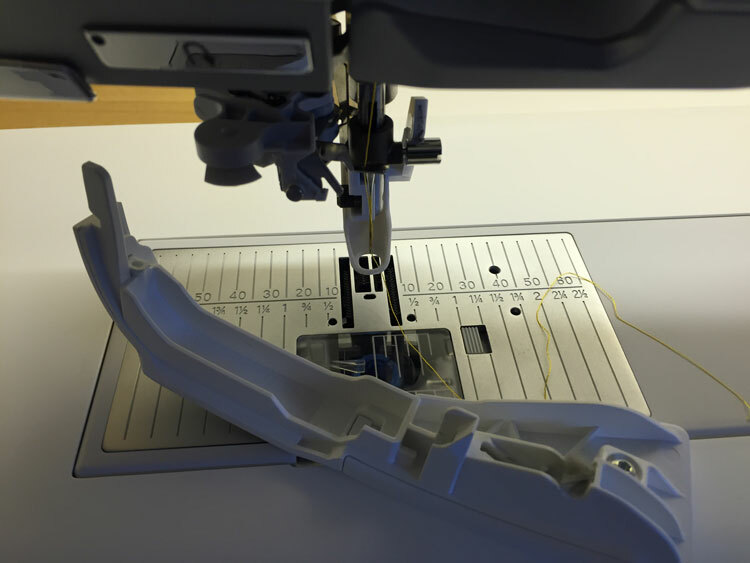 The size of each panel is an indication of the amount of stitching and it is very useful to see the threads listed before you even get to your machine. I was tempted to press the green button but it doesn’t stop the machine. 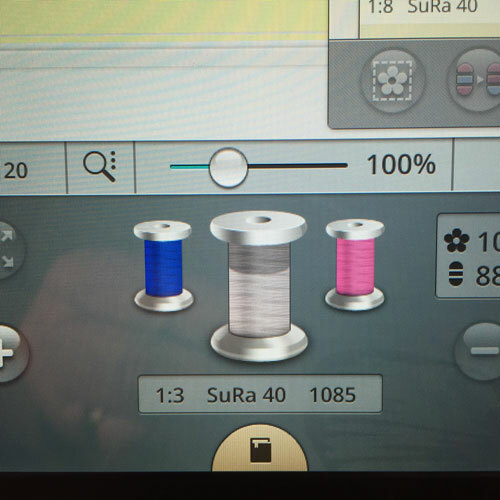 If you check this app while a design is embroidering you will be able to see exactly where it has got to in the stitch count. Makes me wonder how long it will be before we have a camera to view our embroideries from our phones!! 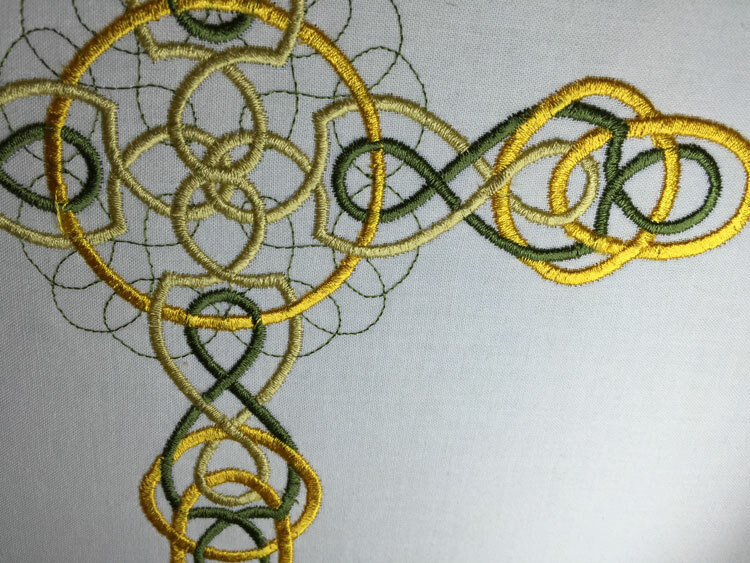 I have so enjoyed those large embroideries with the Imperial hoop which is 360 mm by 260 mm (14.2″ by 10.5″) although I have found that I cannot take short cuts with this big big hoop. It needs to have all its clips in place so that the stabiliser and/or fabric are well supported to avoid puckering. I am hoping that they will bring out a 260 mm square hoop soon. That for me will be the ultimate hoop as I love square hoops as they have the same tension all round. Before you start embroidering you get this wonderful Welcome screen to check everything out before commencing. A great addition with everything clearly laid out. I love these nice shiny buttons that control the machine and the lighting on the machine is superb. It lights my whole studio and makes photography so much easier. NO more grainy distorted photos with weird reflections. The telescopic thread guide works well although I have as yet to try a large cone of thread. The blue bobbins are 30% larger but I seem to be changing them just as frequently, probably because my machine stitches out faster than my Designer Royale. Bobbins can only be replaced now by removing the hoop which is understandable as the bobbin cover comes off from the side with a little button to release it. One of the first things I did was cover the screen of my Epic with a protective screen saver. This will save it from accidents and scratches. Everything works just as well with this in place. If only I could protect the stitch plates from scratches too. The worse offender is my engagement ring and I tend to turn it around to avoid it damaging the plates. However my fingers do not seem to come into contact quite so much with the automatic threader to do the hard work for me. There are 2 plates, one for straight stitching and embroidering. The other plate on the right in the picture below, has a wider hole for zigzag stitching. The smaller hole supports your embroidery too. The other plate sits nicely in the accessory tray when not in use. 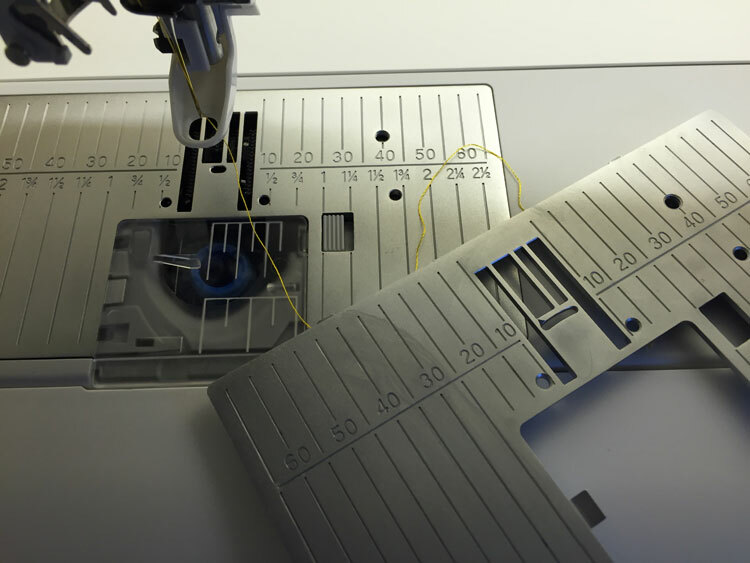 I was worried about using the wrong plate and breaking needles but the machine seems to know which one is in use as featured in the Welcome screen!! That’s a great safety feature. My Wacom fibre tip stylus has arrived and I use it on the enormous screen most of the time rather than my fingers. 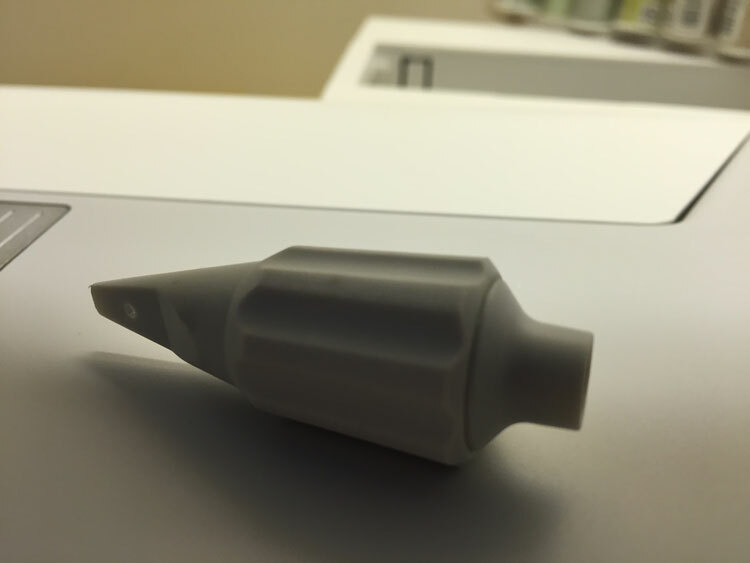 This is the Universal tool used for changing needles, attaching the Sensor Q foot, lifting the stitch plates and other similar jobs. I really haven’t got to grips with it preferring my little screwdriver from my previous machines. 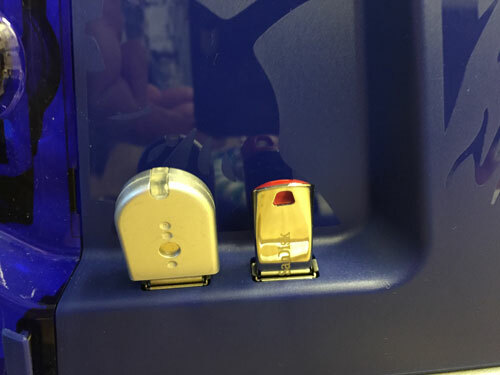 Read somewhere that it would be better if the insert which is magnetic was metal rather than plastic. There are a few features I miss that are not part of the Epic. When I bought my Royale I remember being disappointed that there were no longer 2 manuals. With the Epic the majority of the manual is on the machine. There is a starter manual but I installed the full manual on the Kindle app on my iPad so I can open it alongside the machine. There is no USB stick so I looked into how to format a bought one as there are 2 USB ports by the bobbin winder. Before you use on the Epic, plug it into your computer, right click to call up the properties and format it to FAT 32. With this large USB stick I can have all my Graceful Embroidery designs on my Epic. So far I have not been able to find the timer that tells you how many hours the machine has been used for. The count down timer for each design has disappeared too, which was so useful when my husband wanted to know how long I would be before we go out! Instead you see a spool thread unraveling. Each side of it the previous and next colours are shown. 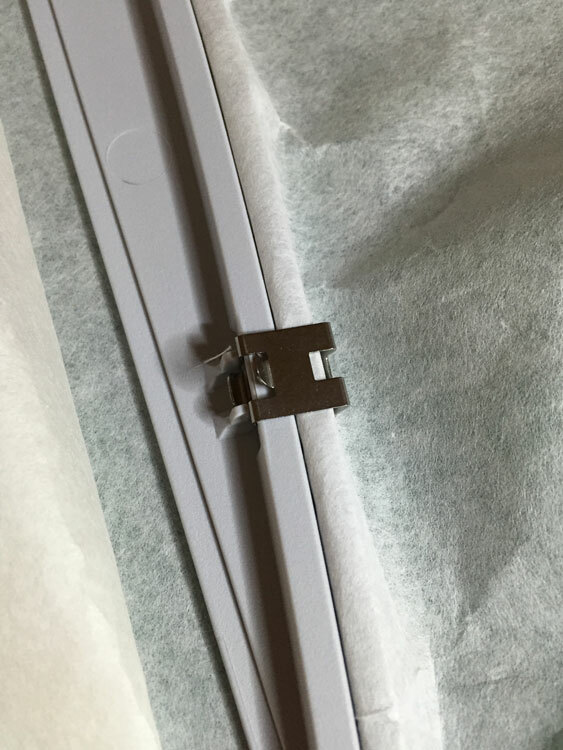 If anybody can tell me where to store my edge/quilting guides I would love to hear from them as there really don’t seem to fit inside the accessories tray. I need to master changing a needle with the Sensor Q foot in place too, which I found tricky as the foot gets in the way. 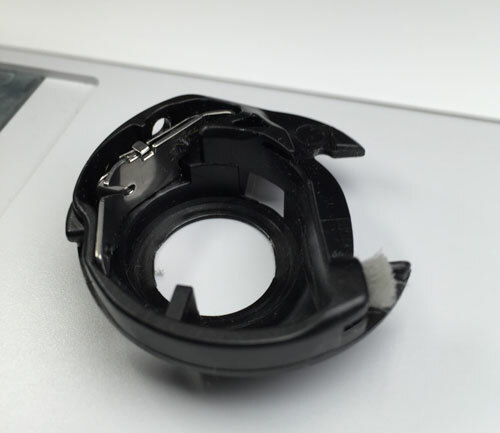 The Sensor Q foot is not very different from the old one and is marginally easier to attach. I had a little incident with the automatic threader and ended up with thread caught inside the tension discs. 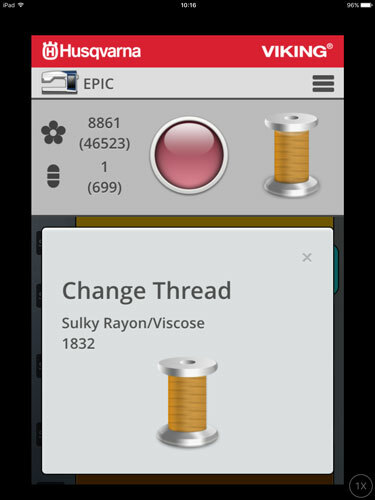 I could see the thread but could not reach it. 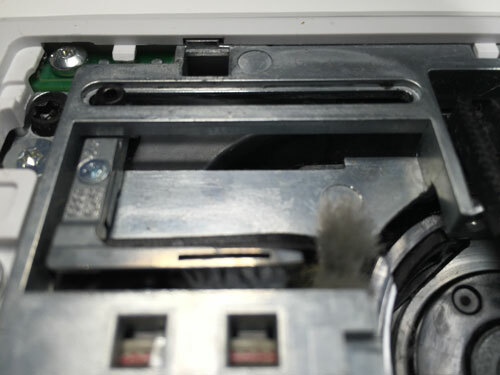 With my previous machine I was able to take off the cover between the threading slots, and remove threads and fluff. A phone call to my dealer confirmed I could do this with the Epic. To release the cover just involves a little more pressure. 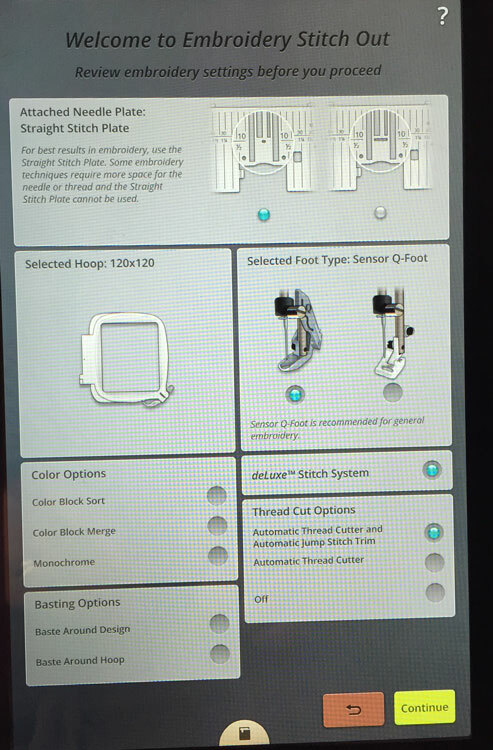 This feature is great and saves visits to the dealers when threads get caught in the tension disc area. Particularly useful when you live 3 hours away. I noticed that the bobbin case holder has little brushes on the right side which is a new feature and there are more brushes in the thread trimming area. This is easier to clean out too. 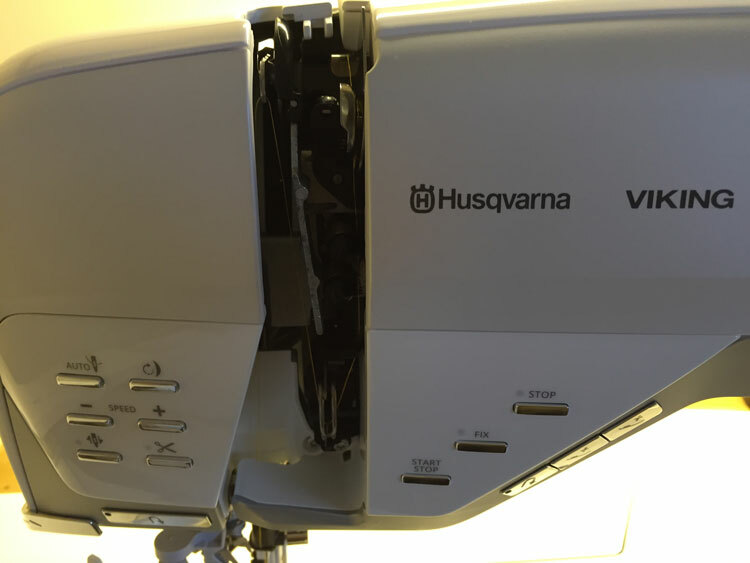 This entry was posted in Discussing machine embroidery, Embroidery machine review and tagged Husqvarna Designer Epic, machine embroidery. Bookmark the permalink. The machine sounds fabulous. Is it also a multineedle machine? No it is not a multi needle machine. If only! I am overjoyed for you. You sound just like I did when I brought home my Brother Dream Machine in Nov of 2014 and I’m still just as excited. Although I’ve had her over a year now, I’m still learning all her secrets, partially due to all the health setbacks I’ve had since then has really cut into my sewing time but also because there’s so many great things to learn. Every time I push the on button, there is a thrill just like the first time I sat down in front of her. Like you, I’m dreaming of more hoops to come and a few other upgrades that I hope Brother will implement thru the computer updates. When my 2 y/o grandson opened his Christmas gift, a standing child-size tool bench, he had the exact same expression on his face that I see on ladies’ faces with new machines and the way I feel sitting at mine. That child-like joy is hard to recapture as an adult but it returns to us as we create beautiful and useful things enjoying our mechanical wonders. Thanks for sharing your joy with us. It does my heart good to hear it. This is the most exciting gift you could give yourself!! I used to sell Vikings and they are the very best. I use my SE Viking that I have had for 6 years and love it. It was top of the line at the time and I still enjoy it so much. I am happy for you. Thank you for including us on your Epic Journey. Like Rita; I, too, have a Brother Dream Machine. Looking back….. I inherited my mother’s 1952 Singer that still sews a perfect straight stitch. In 2001, I purchased the ‘latest and greatest’ Singer XL-6000, believing this machine would never be eclipsed in the marketplace. Oh baby… was I wrong! The point of all this rumination is just how quickly technology in advancing. As to the comment about multi-needle sewing machines; Brother has an embroidery only machine that, I believe, embroiders 8 spools at once. Wasn’t it Browning who said “the best is yet to be”. I looked briefly at the Brother Dream today. There appear to be several similarities but each manufacturer has its own style. It occurred to me as I looked at your photos and writings describing the Epic’s features that it is worthy of a You Tube presentation(s). Perhaps Husqvarna offers better on-line instruction than Brother, but I rely mainly on You Tube instruction given by educated users rather than manuals or the brief video clips in my machine. You write in a clear understandable way, take excellent photographs, and have a passion for your work. Something to think about. Hi! This was a great and informative read! I wanted to know if you could give me a step by step or refer me to to a video on how to remove the cover of the tension discs on the epic. I believe there is thread caught there and I can’t reach it. Thank you and keep on creating! Oh dear! I had this problem and lifted the cover off to remove the threads inside. With my former Royale the cover came off very easily. Not so with the Epic and when I lifted it a small piece broke off making embroidering and sewing impossible. My machine is now repaired but I was told not to lift it off if I could possibly help it. So far I have been not been forced to do so. It lifts from the bottom but please speak to your dealer first. Thank you for your question. I am so pleased that you have the Epic machine. It is amazing. I suggest that you join my Graceful Embroidery group where you can get lots of advice and help from some very knowledgeable members. 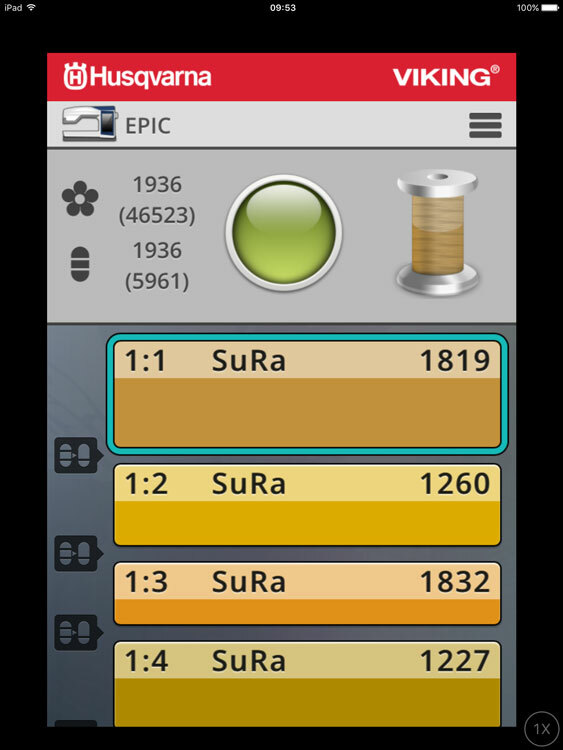 Use the on screen help on your machine, and look for You Tube videos on the use of the Epic. Load up the design and stitch it out on a scrap of fabric to see how it starts and to see the whole shape. You may not even have to finish it as the shape will probably appear. Use this as template for positioning your shirt. Purchased Designer Epic in November 2017. 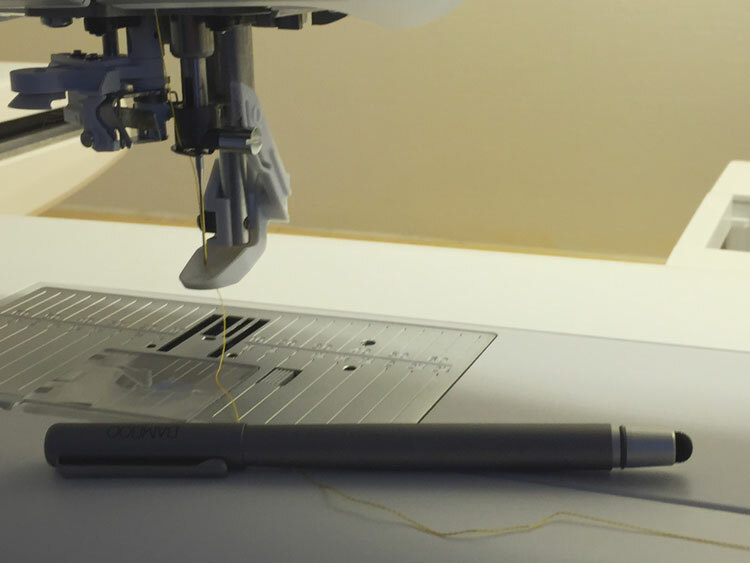 Having issues when doing machine applique embroidery designs, specifically the upper thread being too loose and looping on the underside. Do not want to play with the tension because the problem occurs infrequently (but when it does it means ripping out). Any suggestions or similar problems?